This 6-piece band who release their eagerly awaited third album this October (featuring the single Dance Like Nobody's Watching) have spent the last three years playing sell-out shows all over Ireland and Europe. Lead by singer (former Meteor Award winner) Luke Thomas, they have crafted an act and a live show that keeps audiences coming back time and time again. Don’t miss this theatrical and energetic show performed by one of the most in demand bands in the country! 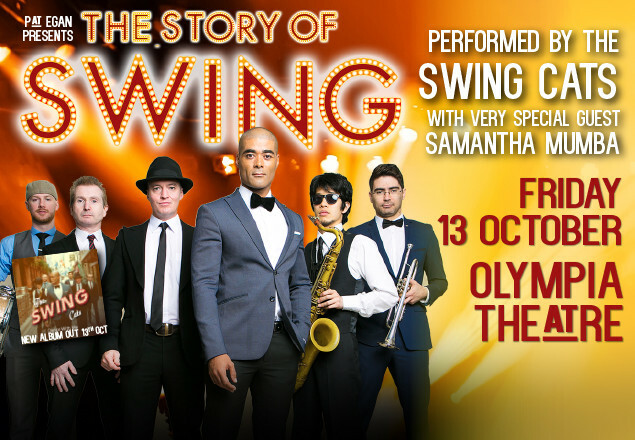 The Story of Swing... performed by The Swing Cats. An absolute must for all swing music fans. Vouchers must be printed and brought along in order to redeem your ticket(s). Tickets are distributed on a first come first served basis.